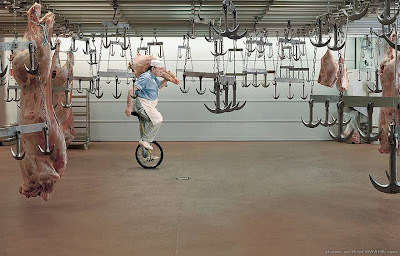 Butcher on a mono-cycle, serious stuff, scary. My computer has been upgraded, new service provider, broadband etc etc. Taking a while to get familiar with all the little changes, this technology will most probably be good for the next 12 months before becoming outdated. What has happened to the millions and millions of the old 'stiffy' discs? And all the information on them?